My daughter recently celebrated her ninth birthday with a sleepover party. As part of the preparation, we went to Kroger to buy food for breakfast. Naturally, she headed straight to the cereal aisle, and like any American entering the supermarket, was confronted with thousands of boxes of refined flour and white sugar that had been molded into various attractive shapes and whose boxes had been decorated with lively colors and characters. She went the extra mile and selected two that also featured chocolate. I bit my lip, let her put them in the cart, and we kept walking. You only turn nine once. The minute her guests left Sunday morning, the still half-full boxes of cereal mysteriously found their way to the trash bin in our garage. (Actually they had to make two trips there, due to my fourteen-year-old’s shenanigans—see photo.) But not before I sneaked a closer peak at their labels. The box for Kellogg’s chocolate Krave announces across a verdant green stripe that it’s a “good source of fiber & made with whole grain.” Even the ampersand is decorated with a leafy frond. 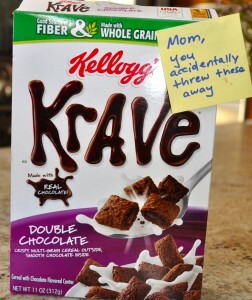 What a healthy, plant-based food chocolate Krave must be. “Family Life is Better when your kids are Healthy! FIBER is an essential part of a healthy diet.” I’ll give you three guesses where I came across this slogan. (1) A carton of prunes. (2) A package of All Bran. (3) The side of a Froot Loops box. If you guessed (3), congrats.